In 5-quart stockpot, heat oil over medium-high heat. Add onion; cook 3 to 5 minutes or until tender and translucent. Add garlic; cook 1 minute longer, stirring frequently. Add thyme, rosemary and 3 1/2 cups of the chicken broth. Heat to boiling. Add macaroni; boil 5 to 7 minutes or until macaroni is almost tender but retains a bit of bite. 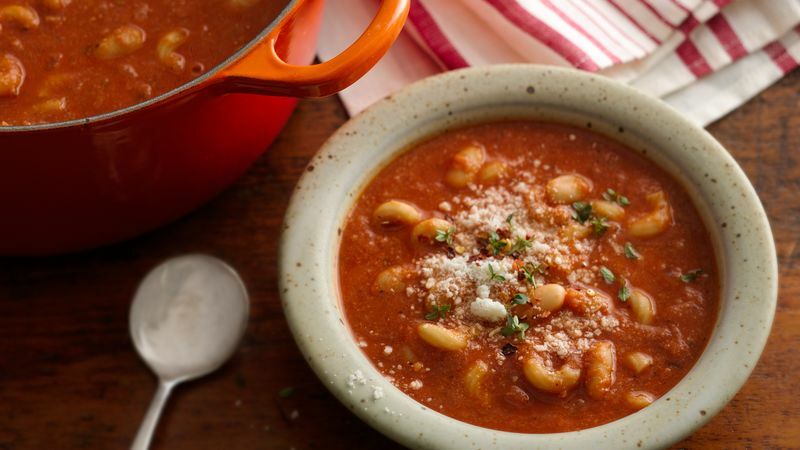 In blender, blend remaining 1/2 cup chicken broth, 1 can of the beans and the tomatoes. Blend until smooth. Add mixture to stockpot along with remaining can of beans and the sausage. Reduce heat to medium-low; simmer 10 minutes to blend flavors and heat through. To serve, ladle soup into bowls. Top each serving with remaining ingredients. Freezer Directions: Make as directed through step 3, but do not simmer 10 minutes to heat through. Ladle soup mixture into quart-size resealable plastic freezer bags; let out any excess air, and seal. Place bags flat in freezer. When ready to eat, thaw overnight in refrigerator. Place in 5-quart stockpot, and reheat over medium heat until heated through. Kidney beans can be substituted for the cannellini beans, if desired.